Pocahontas was the daughter of the Algonquian chief Powhatan. She and her tribe lived in the wilds of Virginia at the time of the founding of the first permanent European colony, Jamestown. She was by all accounts remarkable and important to relations between the English settlers and the Native tribe. Poor relations with the Algonquians and dissent within the colony prompted Captain John Smith, one of the leaders of the colony, to go exploring in search of the chief along the James River. His experiences there form the basis of the legend of Pocahontas. He searched for Powhatan, the chief of the Algonquians, in 1607, along the Chickahominy River. A hunting party attacked the men he left at the boats and captured him. Smith amazed them with his compass, earning an audience with Powhatan at Werowocomoco, 12 miles from Jamestown. Smith later wrote that he was taken to Powhatan and sentenced to death. In his Generall Historie of Virginia published in 1624, Smith described his controversial rescue by the chief's daughter Pocahontas. Pocahontas was a nickname meaning "little playful girl, or favorite." Her real name was Matoaka. "Having feasted him . . . A long consultation was held, but the conclusion was, two great stones were brought before Powhatan: then as many as could lay hands on him, dragged him to them, and thereon laid his head, and being ready with their clubs, to beate out his braines, Pocahontas the Kings dearest daughter, when no intreaty could prevaile, got his head in her armes, and laid her owne upon his to save him from death: whereat the Emperour [Powhatan] was contented he should live to make him hatchets, and her bells, beads, and copper . . ."
His claim that Pocahontas saved him when the others tried to beat his brains out with a rock is probably either invented or romanticized. It is possible that the Algonquians enacted an "execution and salvation" ritual to cement the agreement. This would not be unusual, and it is possible that Pocahontas, who was a young girl, participated in it. [Pocahontas] not only for feature, countenance, and proportion, much exceedeth any of the rest of his [Powhatan's] people: but for wit and spirit, the only Nonpariel of his Country. Later, in 1613, Pocahontas became a valuable hostage to the English. Sir Thomas Dale had her instructed her in Christianity, and here she met a tobacco planter named John Rolfe. She was given some degree of freedom within the settlement. After almost a year of captivity, Dale finally returned her to her father. He brought 150 armed men into Powhatan’s territory to get the entire ransom from the chief. The Algonquians attacked the party, and in retaliation, the Englishmen destroyed villages, burning many houses, and killing several men. Pocahontas went ashore where she met with two of her brothers. She told them that she had been treated well and that she wanted to marry John Rolfe to ensure peace for her people. The bargain was made. The prospective bridegroom was not enthusiastic. He would not consider marriage to Pocahontas until she converted to Christianity and even then had grave doubts. However, in some personal turmoil about his relationship with her, he agreed to the marriage. He wrote a long letter to Governor Dale asking for permission to marry her. "It is Pocahontas," he wrote, "to whom my hearty and best thoughts are, and have been a long time so entangled, and enthralled in so intricate a labyrinth that I (could not) unwind myself thereout." He married her "for the good of the plantation, the honor of our country, for the glory of God, for mine own salvation." 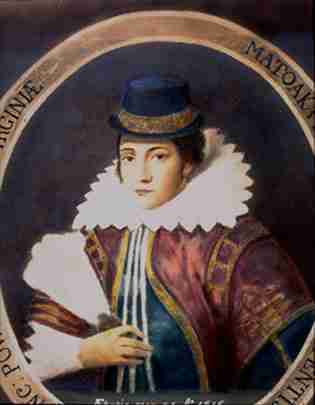 Pocahontas accepted baptism, took the Christian name of Rebecca, and married Rolfe on April 5, 1614. The marriage helped to keep the peace between the Algonquians and the settlers. In the spring of 1616, Sir Thomas Dale sailed back to London to secure more funding from the Virginia Company. He took a dozen Algonquin men. Pocahontas also made the voyage with her husband and their young son, Thomas. The arrival of Pocahontas in London was well publicized and she became a celebrity. She was presented to King James I, the royal family, and London society. Here she met again Captain John Smith, whom she had not seen for eight years. Seven months later, Rolfe set sail for Virginia with his wife and child. Pocahontas became seriously ill (pneumonia or tuberculosis) after they sailed. They took her ashore, and as she lay dying, she consoled Rolfe, with "...all must die. 'Tis enough that the child liveth." She died at the age of 22, and was buried in Gravesend, England far from her home.